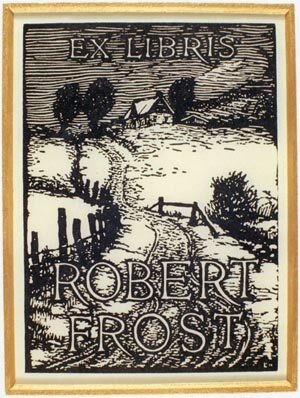 Ex Libris: Bookplates from the Libraries of the Rich and Famous from UVA Magazine on Vimeo. Albert Einstein’s bookplate shows an immense universe of stars and swirling masses. Ernest Hemingway’s depicts two scenes related to his writings: At the top is a log cabin in the mountains and a canoeist on a lake; at the bottom, a matador with a bull. 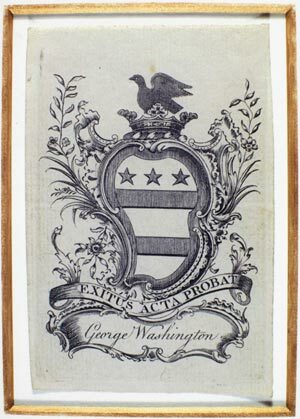 These are just a few tidbits that make the world of bookplate collecting so fascinating for James Goode (Grad ’66). A sample of his treasury is on display through July 29 at the Albert and Shirley Small Special Collections Library and the Rare Book School in Alderman Library. 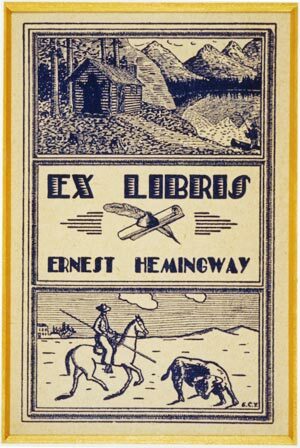 Bookplates, often marked with “Ex Libris” (“from the books of …”), are decorative labels usually pasted on an inside cover identifying the book’s owner. Goode’s exhibit, titled “Three Centuries of American Bookplates,” opens a window on a pastime—and for some a passion—that dates to the immediate aftermath of the printing of the Gutenberg Bible in 1455. One of the prizes in Goode’s collection is a circa 1500 bookplate by German artist Albrecht Durer. “He was one of the first professional designers to make bookplates, and he made about a dozen,” Goode says. Some bookplates are notable for being clever. Actress Gloria Swanson, star of Sunset Boulevard and other Hollywood hits, had a swan and a sun on hers. Others, such as the bookplate designed by Pablo Picasso for his friend Nelson Rockefeller, have a decidedly more abstract appeal. Goode, who for 17 years served as curator of the original Smithsonian Institution building in Washington, D.C., stumbled into the world of bookplate collecting in the fall of 1966. After getting his master’s degree in history from UVA, he was offered a position as lecturer at George Mason University (then a satellite of UVA) in Fairfax County. None in the lot were really important, but they tickled his curiosity. Now he has about 2,000 bookplates, about a third from British designers, the remainder American. The advent of television, a more informal lifestyle in the U.S. after World War II and the proliferation of paperbacks cut into both the popularity of bookplates and the number of collectors, he says. Now there are about 200 collectors in the U.S.; England, France and Germany also have a large number of hobbyists. Goode’s plans include speaking to students in the Rare Book School about the history of bookplates and designers such as Nathaniel Hurd, Rockwell Kent and Peter Maverick.